Lipton Green Tea Sencha - In Indonesian plantations, the leaves are processed according to Sencha tradition, steamed prior to hot air drying. This preserves the freshness to deliver a light green infusion with a refined aroma. Our selection of Sencha, with delicate notes of Osmanthus flower, will offer you a genuine green tea experience. 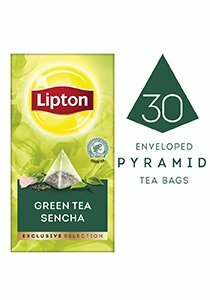 Presented in Lipton transparent pyramid tea bags, which are designed for a better infusion of long leaf teas. Favourite for many kinds of salads including fruit salads and paninis.